Because we are in Southern California among the bronzed and beautiful, Derrick and I have decided that we should take this week to try out one of those meal-replacement plans—you know, when you replace one meal a day with a special drink or shake–to slim down and tone up. After all, when in Rome, right? I mean, it was getting embarrassing, walking down the beach among the g-stringed set with nothing but our vast intelligence to announce us. As you can imagine, a myriad of options presented themselves in our search for the perfect package of protein. We perused the lot, argued a little, went back and forth and back and forth, but in the end agreed that there was really only one meal replacement shake that would meet all of our prerequisites, and it could only be found at Cold Stone Creamery. Thus, we spent the week replacing heavy, fattening lunches for the light and cool refreshment of a Cold Stone shake, ice cream cone or, in some cases, a brownie smothered by both. Oh girlfriends, I cannot tell you how good it feels to just skip a meal and keep things light! Never again will I be a slave to my cravings. Derrick: “Yeah.” (Solemn pause.) “Especially for the thin-wristed.” He shook his head knowingly. He was serious. It was a compassionate observation. 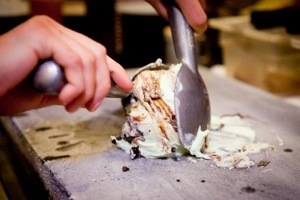 Hand mixing ice cream for the likes of me and Derrick would wreak havoc on the fine-boned set. His comment got me wondering what kind of labor laws were in place to avoid just this kind of exploitation. It also reminded me of an earlier conversation we’d had about this very topic. See, a few years ago, during one of his Weight Lifting Phases, Derrick had bragged to me one day about how thin wrists were all the rage among professional weightlifters. “Yep.” He stuck out his wrist to show me, yet again, what would surely be his ticket to the top of world-class bodybuilding. I patted him on his (thin) wrist. A different twist on celebrating autumn. Is there anything worse than waiting for the person in front of you to buy lottery tickets? Previous Article He was here. Vacation Derrick was here. And now he’s gone. Next Article a pox on the post-vacay letdown.